. Kifune Shrine 貴船神社 Kyoto, Kurama . Near this shrine is an old kofun grave mound area of the 6th century, where a lot of iron relics have been found. So the manufacture of iron goods has a long tradition in the region. Maybe the iron manufacturers brought the belief in the wolf deity with them. The forest around the shrine is rather "wild" and the atmosphere quite remote. Make a salt offering ! Salt is used as a purification material in Japan. The blue plastic container has a few sacks of cooking salt inside, where you can help yourself. A small heap of salt near the offerings box. 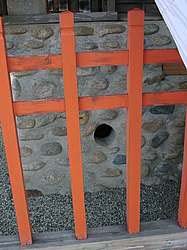 A hole at the back of the shrine to throw in salt. Everything is green with moss and moisture at the back of this shrine. It is said that wolves like to lick salt, hence the salt offerings. (I have never seen this kind of salt offering hole at the back of a shrine. Gable of the main shrine building. Large compound with simple stone lanterns. All around the back are smaller shrines, dedicated to various deities. A simple shrine with a simple stone basis to support and protect from rainwater. Here OSAKI, the "first sign of the main deity" 御先, the wolf servant of the Kifune deity, is worshiped. Here a wolf deity is worshipped, Ookami sama 狼様, who is very helpful protecting people and their property from thieves and robbery. The annual festival in December is in honor of this wolf. and get new ones for their house altar with new power to protect them.
. My Photo Album .
. The Wolf Shrine in Chichibu Mitsumine Jinja 三峰神社 . Another legend says there is also a fox deity worshipped. It protects the region from the floodings of the local river. There is a hole at the side of the shrine where the fox can go in and out. People leave some nigirimeshi rice balls for the fox to appease him. Before a flooding, the fox will give warning, calling kyan-kyan キャンキャン. These two are dragon deities who provide abundant water for the region. They are the main deities of the Kifune shrine in Kyoto. rain　雨 at the top, then three open mouths　口　and the dragon 龍 at the bottom. Ooko Kifune Daimyoojin 往古貴布禰大明神, in Meiji the shrine was named shorter, Kifune Shrine. This is the most important shrine in the compound. People come here to pray for protection from evil, protection from infectious diseases (important in the Edo period), protection from fire and thieves. Kami produced from the blood that dripped from Izanagi's sword when he killed the kami of fire, Kagutsuchi. When Izanagi's consort Izanami gave birth to the kami of fire, she was burned and died. Enraged and saddened at the loss of his wife, Izanagi beheaded Kagutsuchi with his "ten-span sword," and numerous deities were produced from Kagutsuchi's blood. According to Kojiki, Kuraokami and Kuramitsuha were produced from the blood as it collected on the hilt of Izanagi's sword and dripped through his fingers. According to an "alternate writing" related by Nihongi, Izanagi killed Kagutsuchi by cutting him into three pieces, thus creating the three kami Ikazuchi no kami, Ōyamatsumi, and Takaokami. The word kura is said to mean a narrow gorge beneath a cliff, while okami refers to the dragon tutelary of water, and mitsuha suggests the water as it begins to emerge, or a water-spirit.
. Kagutsuchi カグツチ / 軻遇突智 Kagu-tsuchi - "incarnation of fire" .
. Rain Rituals in Japan . The Kume Kifune shrine faces the local river and a side-road of the Old Trade Road to Izumo, now the prefectural road 429. It is located on a hill above the village Kuwakami 桑上, with steep steps up. ーーーーー　. 出雲街道 Izumo Kaido . There was no access road for cars, so in modern times the villagers build one from the "back side", cutting through the mountain and the pristine shrine forest and reaching the "Wolf Shrine" first, then going down to the main shrine. The slopes of this cut are quite remarkable, with sand waves, overhanging tree roots and small bonsai-like fern islands on the slopes.
. Kifune Shrine - access road impressions .